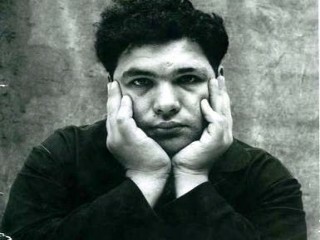 Sir Eduardo Luigi Paolozzi was a Scottish sculptor and artist. He was a major figure in the international art sphere, while, working on his own interpretation and vision of the world. Paolozzi investigated how we can fit into the modern world to resemble our fragmented civilization through imagination and fantasy. By the dramatic juxtaposition of ideas in his work, he let us see the confusion as well as the inspiration. After a near-fatal stroke in 2001, Paolozzi suffered brain damage and was wheel-chair bound. He lived for another four years before dying in his sleep at the age of 81 at a hospital in London on April 22, 2005. He is survived by his daughters Louise, Anna, and Emma. View the full website biography of Eduardo Paolozzi.